I had 2 thought when I was looking at Zoe's old t-shirt... 1. She really LOVED it and it is a shame to throw away and 2. 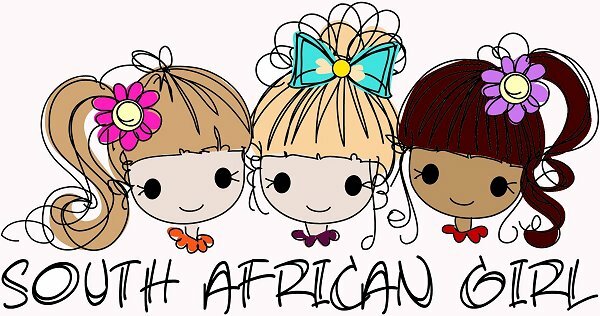 Where can I find a Hello Kitty T-shirt for Zoe's doll? And so the recycle began! 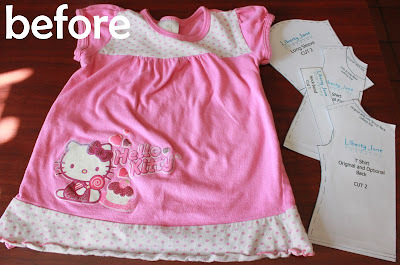 It was so easy and fun to do that I will be doing this with more of her old clothes... I love that the shirt is now sentimental to her and also that she has a great picture for her doll's shirt! 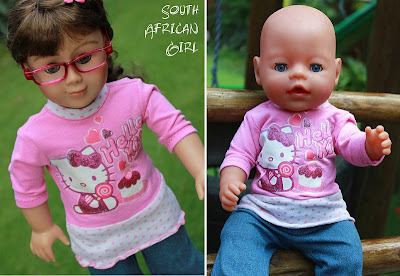 Something that impressed me too was that I had planned the shirt for her South African Girl 18" doll and when I fitted it on her Baby Born doll it worked great! The sleeves were a little snug so I will cut them a little wider next time. 1. Liberty Jane has a great free T-shirt pattern. I used the Variations pattern for the t-shirt pattern as I wanted a high neck to preserve the graphic and a 3/4 sleeve. 2. 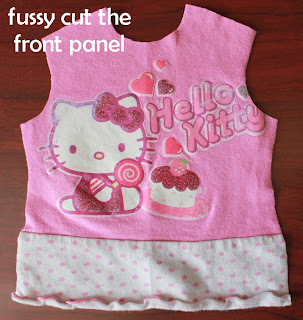 Once your pattern is printed you can plan your placement on the shirt. You have to fussy cat so that you can get the whole picture in nicely. 3. Sew the shirt following the instructions. 4. When adding the velcro you can add the label. 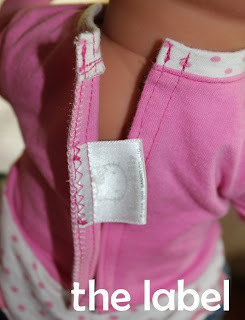 I carefully cut the label out of the original shirt and sewed it into the doll shirt. And there you have it! It turned out so cute and Zoe loves it!